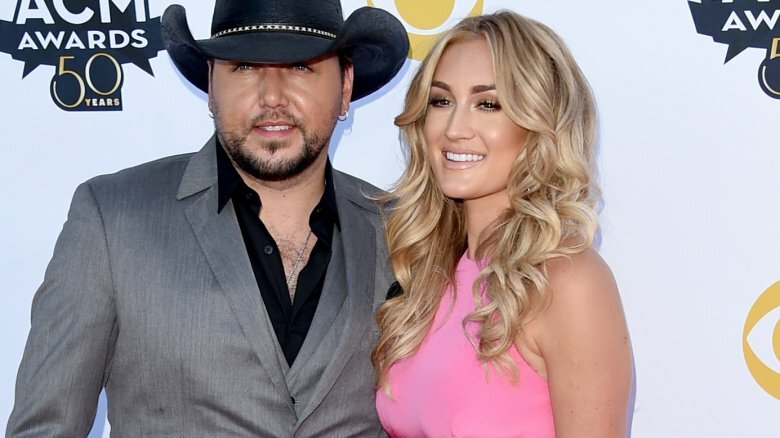 Since 2014, country superstar Jason Aldean and wife Brittany Kerr have been red carpet staples at industry awards show where you can almost always bet on Aldean coming home a winner. On top of Kerr's active Instagram posting, the couple couldn't look happier together. But Aldean and Kerr's relationship isn't exactly a fairy tale—especially in the beginning when their growing romance made headlines for all the wrong reasons. Not even two months after Aldean portrayed himself as a devoted family man in a 2012 cover story for People magazine, TMZ caught the country singer drunkenly making out with Kerr, a former American Idol contestant and Charlotte Bobcats dancer. It was bad. With the incident caught on camera, Kerr and Aldean both worked quickly to downplay the incident as a drunken, one-time mistake. She released a statement saying the situation was a "lapse in judgement," and he apologized for his actions on Facebook. "The truth is that I screwed up," Aldean wrote. "I had too much to drink, let the party get out of hand and acted inappropriately at a bar. I left alone, caught the bus to our next show and that's the end of the story. I ultimately ended up embarrassing my family and myself. I'm not perfect, and I'm sorry for disappointing you guys. I really appreciate being able to work through this privately with my family and for all your continued support." But that wasn't the end of their story. Not by a long shot. As the scandal blew up, Kerr's Twitter page became flooded with irate country music fans calling her a "homewrecker" and other strongly worded insults. The situation got so ugly, that the former Idol contestant deleted her account and took her case to TMZ where friends claimed Kerr had no idea that Aldean was married. Except there was one small problem. TMZ released footage of Aldean clearly wearing his wedding ring on the night the two were caught kissing. In fairness, Kerr was admittedly drunk and might not have even noticed the ring. But as the months went by, it became obvious that there was more to the future couple than just a few too many drinks at the bar. 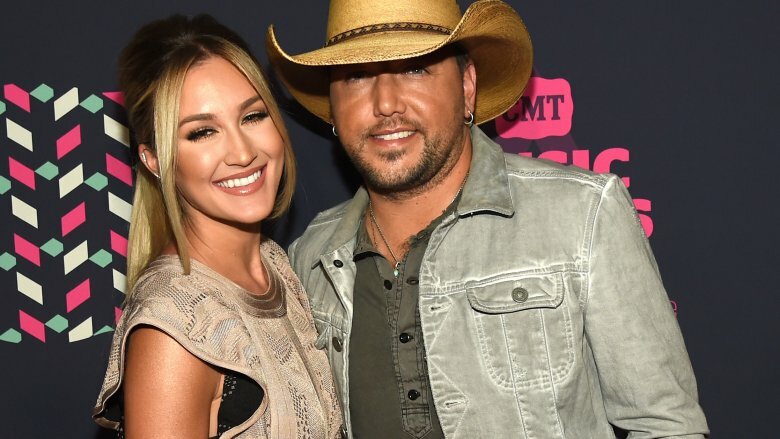 With the buzz slowly dying down, Aldean sat down for an interview with CMT Insider where he sure made it sound like he was staying with his wife of 11 years Jessica Ussery. "The main thing is that me and my family are OK, and everything's good there," he said. "And the rest of it will be us dealing with it in private and trying to fix it." However, things got sketchy when Aldean filed for divorce just a few months later in April 2013 and managed to keep a lid on his private life for almost a year. But in April 2014, Us Weekly confirmed that Aldean started dating Kerr immediately after the divorce, which raised all sorts of questions about how long they were really together or if they ever stopped seeing each other after that first kiss. Soon, it became crystal clear that their infamous drunken night was potentially more than just a one-time thing. 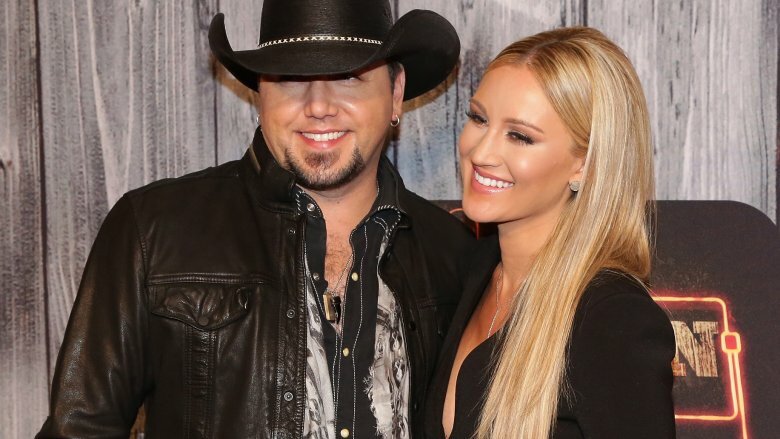 After going public with their relationship, Kerr faced another onslaught of criticism on social media as Aldean followers flooded her Instagram with negative comments, according to People. But Aldean wasn't having it this time and fired back with an Instagram post of his own. "So sick of people judging me and @brittanylkerr over things they know nothing about," the country singer wrote. "I have made mistakes but i am a better person because of it, and wouldnt change a thing. I'm happier than i have ever been, so thank u to all the people who support us. We are happy and life goes on. Its time to move on people. #aldeanarmy #oldnews #timetomoveon"
Aldean's anger also came out in an interview with Billboard where he bluntly stated, "It has been two years of this s**t — get over it, already!" And while you could argue that Aldean's private live isn't anyone else's business, we're pretty sure his ex-wife and the mother of his two daughters is entitled to an opinion. 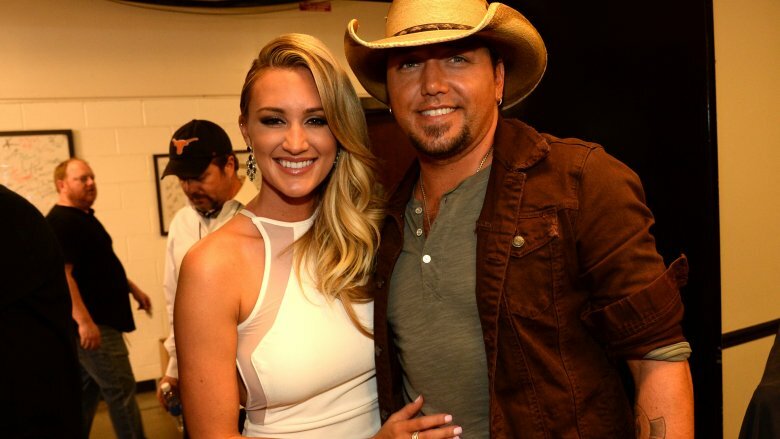 As Kerr began to share more pictures of her relationship with Aldean around May 2014, Nashville Gab reported that an Instagram account that is "definitely" owned by Aldean's ex-wife Jessica Ussery commented on a photo of Aldean and Kerr after it was posted to the now-defunct Aldean Army Instagram. Needless to say, Ussery was not a fan of the relationship. "Had to comment….just sittin back watching God work……" jessgirl_21 wrote. "They have created there own mess …..lol….funny …..everyone does have an opinion….people still have morals too, but We know the truth….my kids do…..most importantly God does … this was too funny….happiness isn't made from lies and destruction of innocent people……IDC…I know the whole truth! 20 yrs worth!! @brittanylkerr"
If these words really did come from Ussery, and Nashville Gab is confident that they did, it only adds to the speculation that Aldean and Kerr probably weren't being truthful about when their relationship really began. But that clearly wasn't a concern for the couple as they made a big announcement just a few months later. In September 2014, just shy of the two year anniversary of Kerr and Aldean getting caught on video locking lips, the couple announced they were engaged. However, the Washington Post couldn't help but notice that the news was conveniently timed with the release of his album Old Boots, New Dirt. The album also featured the highly sexual track "Burnin' It Down," which Aldean's camp worried might stir up more controversy about his relationship with Kerr, according to Billboard. But the country singer either didn't care or was playing into the media swirl. "I finally just went, 'This is the single.'" he said. "I'm in a fortunate position that not a lot of artists get to be in where I can go in there and do that." Aldean's instincts were right as "Burnin' It Down" became another hit, and he made the right choice in powering through the controversy with Kerr. The couple wed in March 2015, and Us Weekly reported that his daughters from his previous marriage were even at the beachside ceremony. And while that doesn't mean Aldean and Kerr made peace with Ussery, it was a sign that the newlyweds were moving past the questionable start of their relationship and striving to include his daughters in their new future. But even though the kissing scandal was in Aldean and Kerr's rearview, there were still bumpy roads ahead. Not long after marrying Kerr, Aldean stirred up headlines after Nashville Gab published a photo of the him decked out in full blackface while dressed as Lil Wayne for Halloween. It was not a good luck for the country singer especially considering his questionable relationship with the Confederate flag. It also didn't help that Aldean's apology wasn't exactly sincere, and it sounded like he doesn't think he did anything wrong. Which for the record, he did. "In this day and age people are so sensitive that no matter what you do, somebody is going to make a big deal out of it," he told Billboard. "Me doing that had zero malicious intent … I get that race is a touchy subject, but not everybody is that way. Media tends to make a big deal out of things. If that was disrespectful to anyone, I by all means apologize. That was never my intention. It never crossed my mind." However, while Aldean took all of the flak for his unfortunate choice of costume, Kerr isn't entirely innocent in the ordeal either. Aldean told Billboard that Kerr is the one who painted his face, and it's rarely mentioned that she's wearing cornrows while standing right next to him in the controversial photo. Just like their kissing scandal, this was a group effort. In September 2016, Aldean released the music video for his single "A Little More Summertime," which notably featured romantic moments between himself and Kerr. 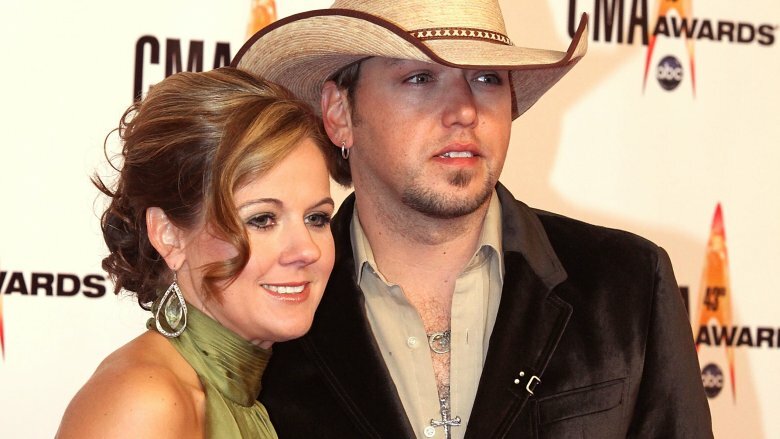 But it didn't take long for Country Fancast to recall that Aldean made a music video for "Laughed Until We Cry" in 2007 that featured his then-wife Jessica Ussery. And, hey, we get it. 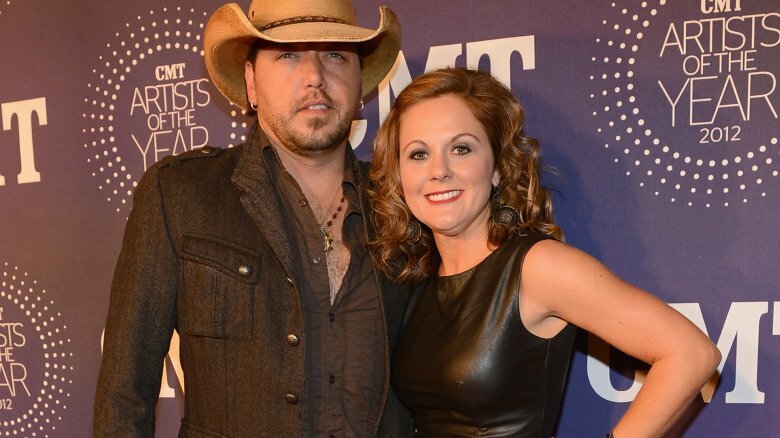 Aldean remarried, and so did Ussery in 2015. It was only a matter of time until his new wife popped up in a music video even if it might not be the most sensitive move. However, Country Fancast noticed that the videos were perhaps a little too close for comfort. "The visual stories, though directed by different individuals, both feature Aldean's spouse, a seaside location with carnival rides, and similar creative elements," the country site wrote. "It's almost like a re-write of the 'Laughed Until We Cried' music video." So, yeah, that's an awkward situation, but it's not exactly out of character for Kerr and Aldean who were becoming more and more bold with public displays of affection. While Aldean spent the beginning of his relationship with Kerr telling the media and fans to stay out of his private life, her Instagram has been a different story altogether. The account is loaded with photos of her with Aldean along with vacation pics with his daughters from his previous marriage. Oh, and lots of PDA. So it's no surprise that Kerr took Instagram for the biggest share of them all. "SURPRISE!!! WE ARE PREGNANT!!!" the ecstastic mom-to-be captioned a photo of her and Aldean wearing "Baby Mama" and "Baby Daddy" T-shirts. "This was the hardest secret we've ever had to keep 🙈 This journey for us has been full of many happy times & also many tears… The biggest rollercoaster we have ever been on, without a doubt! All of the moments of heartache were followed by the biggest blessing in the entire world!! We will never take one moment for granted & can't wait to meet you, sweet baby!!!" Granted, appearances can be deceiving, but Aldean and Kerr sure came a long way from his standoffish days with press. But don't worry, Aldean would still find ways to cause trouble. 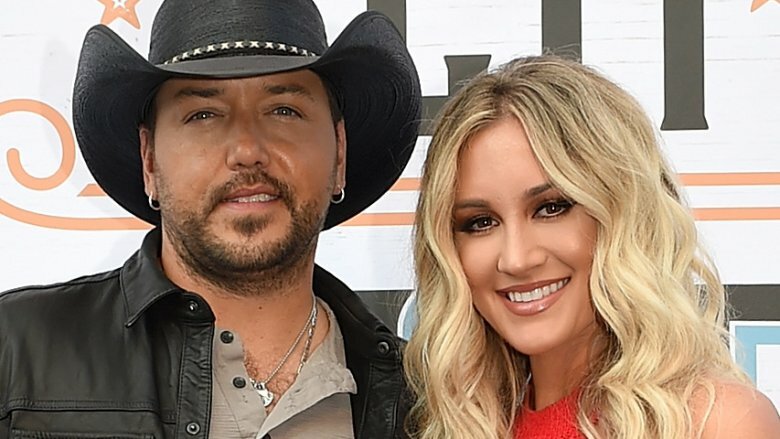 While walking the red carpet at the 2017 CMT Awards, Aldean made a joke to Entertainment Tonight about what he won't be naming his son, and it was a pretty deliberate jab at a certain celebrity couple. "It will be something unique and different. Nothing crazy like a direction—East, West, North, South— none of that stuff," Aldean said in an obvious reference to Kim Kardashian and Kanye West's daughter North. "It will be something really cool. Both of us have names that are pretty common, Jason and Brittany, so, something that's kind of unique is kind of our main goal." At the end of the day, who doesn't enjoy a good Kimye joke? However, Aldean's probably not the best person to insult a rapper's choice in baby names after the whole blackface controversy. We're just saying. Aldean and Kerr's relationship clearly didn't have the greatest start. But despite the tabloid headlines and speculation about what really happened, no one knows the whole story about what went on behind the scenes except for them and Aldean's family. Granted, the situation might not be ideal, it's clear that Aldean and Kerr have made it a point to keep his daughters in their life, which hopefully points to them finding peace with Ussery. (Although, remaking a video Aldean made with her probably wasn't the best move.) However, the country singer and former Idol contestant's marriage is about to face its biggest challenge yet: A new baby. Will Aldean and Kerr have what it takes to go the distance? Or is there another scandalous TMZ video waiting around the corner? Only time will tell.